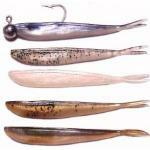 I was out fishing for bass and I tied on a new mega bait soft plastic thing I bought, it is a bigger version of a fin-s and it looks like a small weakfish in my opinion. So I am fishing off a dropoff about 20ft and after walking and casting with no results I took one really lucky shot Well as soon as the mega bait hit the bottom my 8'6 light spinner went DOWN! I didn't even begin to reel, I set the hook like a mad man and to my surprise it felt like bringing in nothing at all really, with the combination of early season and cold water the fish wasn't that active. It came to the surface and I screamed doormat and my dad came and pounced on it like a cat, and he is 6'4. The huge fluke spit up a 6inch weakfish (I could tell by the tooth) onto my boot and I got my boga and he measured almost 10 with the weakfish and 9 without no joke, I think he was 29inches. Well after using a whole role of film I am happy for life. 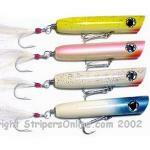 I go back next week and I am getting bass, blues, shad, weaks on a 1-inch fin-s when the same thing happens. I bring him in and I yell "bigger than the other" and this time I pounce on him. Well, he wasn't nearly as big, only 7, but these are still the biggest I have ever got BY FAR. I am in heaven! I truly found an awesome spring spot to take monster fluke. It is obvious that their main forage in the really early spring is new fresh from the factory weakfish, I could even see some weakfish facing up-current nailing shrimp. When the water temp gets a little warmer, they won't hit anything bigger than 2-inches, now they are nailing fresh from the factory spearing. It is a weird thing to face in these locations considering a mile to any other direction and it is a whole different ball game and the fish are just so much different in their eating habits. Well, I have been dying to get this off my chest, I haven't been fishing in 3 weeks! I cut my teeth fluking from Barnegat Light rental skiifs with my Dad, his friend and my brother. In those days we would go out and literally fill a 20 gallon galvanized garbage can with fish and call it a day. What did we know? (I was 9 or 10 at the time) Well, we all know how that fishery crashed. But back to the tale. We're out one day drifting in the channel leading north of the party boat dock to the inlet. We're have a hell of a day -- just bailing fluke. The average fish were going 3-6 pounds and we had a couple in the 8-10 pound range. Then I hook up with a true beast. We literally had to fold the fish in half to fit it into the garbage can. Then it flopped the lid off. My Dad grabbed it, put it back and sat on the lid! Next thing I know my brother hooks up. That fish was slightly smaller. That pretty much filled the can which meant we were done for the day. We never weighed those fish but looking back at the pictures it's pretty amazing to see my brother and I with fluke that are almost as tall as us! My fish comes up to my chin and I'm barely holding it off the ground. We figure those two fish were around 36-40 inches, probably over 15 pounds each. Allen, you are very right, it was bizarre. Seems the fish followed the chum line up. If I remember correctly all I was using was a small split shot for weight, so the bait did not get down too far. However, I have seen fluke on the surface on more than one occasion so the catch was no fluke - I guess. Other than that fish, biggest was about 6 lbs. Alaska is place for large flatties. just got back. day 1 app. 80 halibut from 15-40 lbs on jigs and bait.day 2 caught our 8 fish limit of halibut from 20-50 lbs in 1/2 hour jigging around other boats. day 3 caught our limit of halibut with many throwbacks, one 80 lbs, one 70 lbs, several 50-60 lbs, and my own personal best of 110 lbs.it was 61" long.475 feet of water. also went out on marlin V two years ago. got 8-1/2 lb fish on snapper. won 380 pool that day. came back next day and got seven fish over six pounds. that was in october. also same year got a 9 lb on the marlin iv with ed beneduci at the hooter bouy block island.also another 8-1/2 lb on marlin iv at the light house off montauk point.last year i wore fish repellent, terrible fluking for me.pretty slow so far this year too for me. Hi splnew. Been on any Marlin 6 trips this year? Can you describe the silver bullet based "Korean rig"? I tell ya, I've been fluking for a very long time and I have seen many floormats through the years. I still remember back in 1972 fishing on a rental boat (Gone Fishing Marina) where we culled countless 7-9 lbs. fluke... and we would have a few in the double digits (10 lbs. +). My personal at that time was 13 lbs. and I've been trying to break it since. Fortunately I've been fishing some very prime doormat grounds and this year alone... I've caught 4 fluke over 10 pounds... but yet to break my best. The key to big fluke is understanding the big fish migration and knowing when and what to use! Although I stopped chasing those fluke now (now chasing the pelagic speedsters)... I am confident that I will break my best next year. Al you don't target the barndoors LATER in the season? Larger fish are taken, not in huge quantities however late August-September once they begin their migration in this area - typically thats when we do our best with larger fluke..
Any reason why you target the larger fish earlier in the year, say June/July? Are the fish present in your area at that time, and they're migrating southward towards the NJ/NY area from E LI? i know that alot of people have been taking off the hook on the ball and replacing it with a short piece of mono,and tying a hook anywhere from 4" to 12" from the jig.another trick they are doing is to tie a flasher in front of the hook like the ones you use salmon fishing but smaller. Just got back from a long fishing trip (Bluefin Tuna / Stripers / Local grounds)and saw your post. I dropped a true doormat in the Shinnecock Canal when I was about 13 or 14 y/o. I was snapper fishing, (probably with a zebco, but I really don't remember), using spearing and snapper hooks. I got it to the top fairly easily all things considered. A fairly sizeable crowd gathered, BUT NO NET WAS ANYWHERE TO BE FOUND....... This flattie, who I believe was well over 10 (I haven't caught them over 10 but even at that point, I had seen several (again, Triet, relatively speaking) fishing private boats out of Montauk and Shinnecock Inlet) did not like it at the top, and didn't stay more than a second. He snapped my 8 or 10 pound test fairly easily with a slap and dive manuever, and I had one of my first real fish stories about the one that got away. And, I have carried the mojo ever since. Yes, The Shinnecock Canal holds some very impressive doormats during the early Fluke season and I've seen some big fish get away! In fact... that's one of my early stomping grounds. How are ya and send my regards to Hugh! Hopefully we can fish together this fall.